Birding Is Fun! : What is the Future of Birding Clubs? I've attended a few bird walks over the years that have been very enjoyable, but I've only been to one birdwatching club meeting. The folks there were some of the nicest, charming, and hilarious folks I'd ever met with. It felt good to be with people who appreciated and related to what I enjoy. The opportunity to hear a presentation about birds I only dream about seeing was very enticing for me to attend. At the same time, It looked like I, at 32, was one of the youngest people in the room. There were two other younger gals there, but they too had "Visitor" badges on. It got me wondering, "What will be the future of birding clubs and associations?" It seems like we are creating more of an internet society of birders through listservs, websites, and blogs that seem to eliminate some of the original purposes of clubs meeting together to share what they have been seeing. Will technology bring an end to groups of birders meeting together face to face? 1. Birding is often a solitary activity, but it does make for a good small group activity too. Any birder who wants to learn quickly will benefit by the mentoring of more experienced birdwatchers. 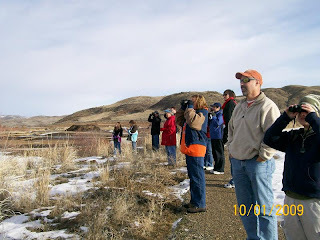 Birdwatching societies are the most likely to organize field trips and educational opportunities. I don't see demand for this decreasing. 2. Birding clubs also organize for guest speakers. This is not to likely to occur at the bird-blogger level. I'd be hard pressed to be able to pull together and fund a celebrity birder guest speaker on my own accord. 3. With a growing ecological awareness in the world, mostly related to the green movement and the threat of global warming, more people are getting interested in birds and nature. People lobbying for conservation find much greater strength in numbers. Pooling financial resources and sheer quantities of concerned folks will better bend the ear of elected officials. I predict the birding festivals will continue to grow in magnitude. As the birding passtime grows, so does the business of birding and festivals are a great opportunity for direct marketing. Eco-tourism will probably continue to grow at the same rate. If, however, scandal, scientific fraud or bias or naturally reversing climate trends occur then the nature-friendly movement may also decline. Regardless, there are always people out there that appreciate wildlife.